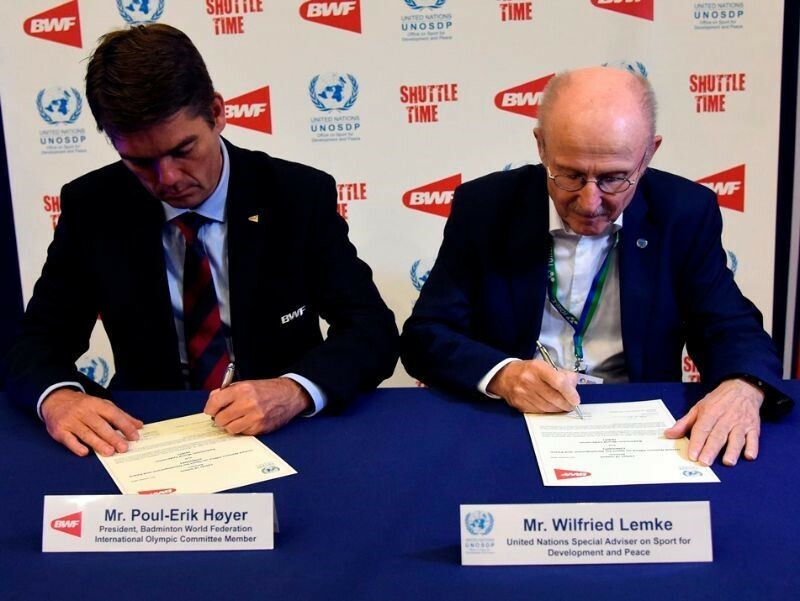 Badminton World Federation and the United Nations Office on Sport for Development and Peace (UNOSDP) recently signed a Letter of Intent to collaborate – using BWF’s Shuttle Time programme – on grassroots development. Cooperation will primarily be channelled through the UNOSDP Youth Leadership Programme which BWF has already supported this year with Shuttle Time training at camps in Colombia, Germany and the USA receiving great feedback. Next year, BWF will support four Youth Leadership Camps with the provision of resources and tutors who will deliver an adapted Shuttle Time course to Youth Leaders. 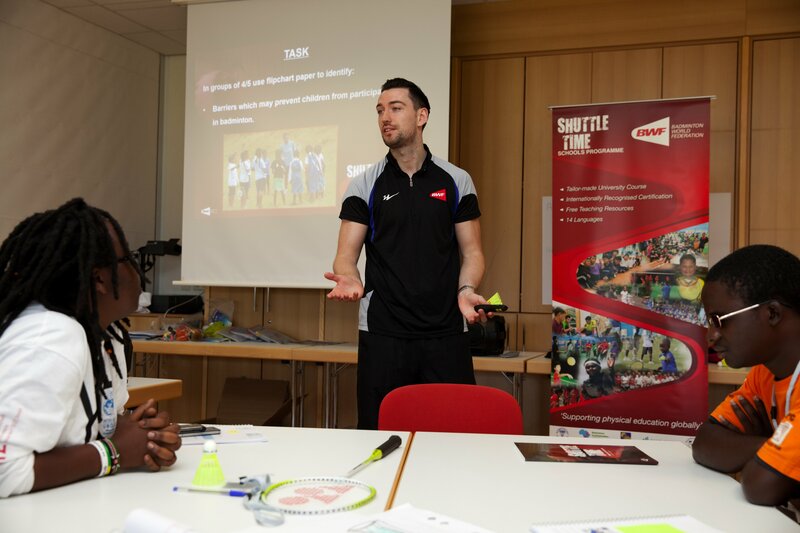 BWF will facilitate opportunities for Youth Leaders to become involved in Shuttle Time projects in their country in partnership with BWF continental confederations and member association. BWF President Poul-Erik Høyer (left) and UN Adviser on Sport for Development and Peace, Wilfried Lemke, signing the Letter of Intent and sealing the agreement with a handshake. The signing ceremony took place at Stade Pierre de Coubertin in Paris where the Yonex French Open 2015 was held. UN Special Adviser on Sport for Development and Peace, Wilfried Lemke, joined BWF President Poul-Erik Høyer in formalizing the agreement between the two organisations and upheld badminton as a great sport through which “to support people from disadvantaged backgrounds; to give them a chance in society”. “The aim of the Youth Leadership Programme is to teach disadvantaged youth, at the grassroots level, how to use sport to bring about positive transformation in their communities. 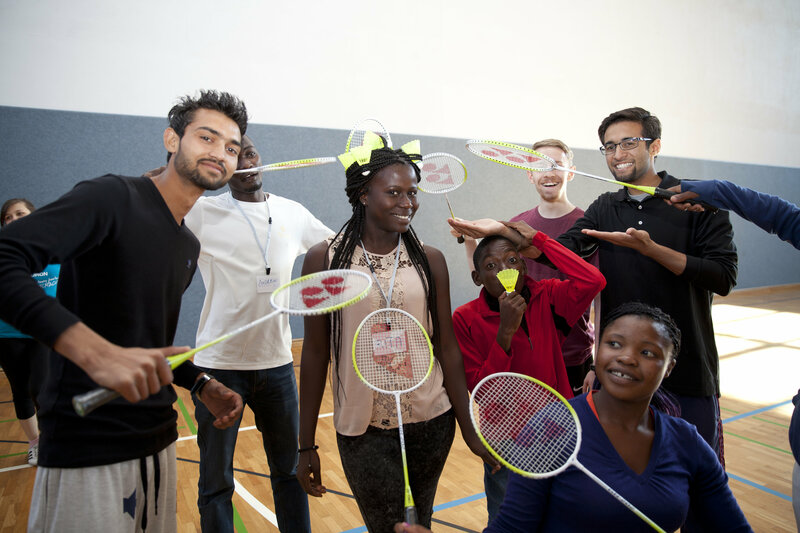 Badminton has recognized potential for accelerating development and peace efforts, and through the Shuttle Time training it will become a valuable asset to young role models striving to change the world for better. “This is a win-win situation. We can do something for you and you can do something for us,” said Lemke, adding that he was enthralled by badminton having watched Indian star, Saina Nehwal’s compete at the French Open. Meanwhile, BWF President Poul-Erik Høyer stated it is BWF’s goal to develop grassroots badminton globally and he welcomed the partnership with UNOSDP to enrich the lives of disadvantaged populations worldwide. Badminton World Federation. Shuttle Time. Youth Leadership Camp (YLC) organized by UNOSDP and GIZ. Berlin 2015. (c) Esteve Franquesa. “If we can contribute to a better life for others, what better way than to cooperate with the UN; to help those who we can assist and to tackle social issues globally. Shuttle Time is now on the curriculum for UNOSDP Youth Leaders Camps and courses will be developed on a regional basis, using Shuttle Time’s 17 language versions accordingly. “We are pleased to have this opportunity to develop the sport we love even further and we look forward to providing relevant resources and expertise to Youth Leaders and exposing them to Shuttle Time and to badminton’s wholesome values,” concluded Høyer.